a biological population of small size animal species: microfauna measuring from a few µm up to one mm and specific to the site. bacteria (flocculated, filamentous, dispersed): 1012 · L–1. Note: algae are the sole representatives of microflora but only play a role in polishing lagooning. In purifying biomasses, bacteria constitute the largest group; this group is also the main protagonist in the removal of pollution (metabolisation) and in the formation of floc (exopolymers). The nature of the substrate will encourage one genus to the detriment of the others, e.g. Pseudomonas for discharges that are rich in glucides. In the same way, the presence of certain compounds and, above all, environmental parameters can enhance the development of filamentous bacteria and/oractinomycetes that impede sedimentation (the bulking phenomenon) and/or create "biological disorders". Table 8 contains the main filamentous forms. 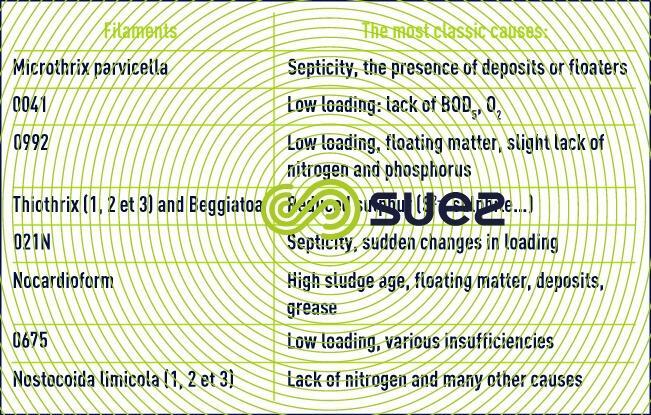 Should filamentous sludge appear (main problems associated with operating an activated sludge system), a three-phase programme may often be essential in order to rapidly reinstate normal operation. The first step consists in prioritising a quick and practicable method using an optical microscope, without any incubation time or biochemical testing, such as the widely used Eikelboom method that is based on easily interpreted morphological descriptions. As soon as the filament has been identified, the cause(s) of its development must be eliminated (table 8). In most cases, a chemical treatment will be essential in order to rapidly reinstate normal operations; nevertheless, it is only by eliminating the cause(s) that we can avoid a chronic recurrence of the problems. In most cases (except that of the more resistant sheathed bacteria), treatment using chlorine (or its compounds) will easily lead to a considerable reduction in filament mass. The amounts used will vary from 2 to 6 kg Cℓ2 per tonne of dry solids present in the aeration phase and per day. This method produces fast effectiveness and results (a few days) when the amount used is properly calculated and the treatment carried out meticulously. Hydrogen peroxide (H2O2) can also be used to fight filaments. Unlike bacteria, microfauna in activated sludge and in attached growth biofilms, consisting in protozoa and metazoa (see animal kingdom), can easily be seen under an optical microscope; as the microfauna is particularly sensitive to changes in the medium, it provides information on the extent to which the biomass adapts and is indicative of the "stress" it has suffered. The effectiveness of an activated sludge plant, in particular, is closely correlated to the density of its microfauna. A density of more than 107 individuals per litre (excluding the small flagellates) is the mark of a good treatment. 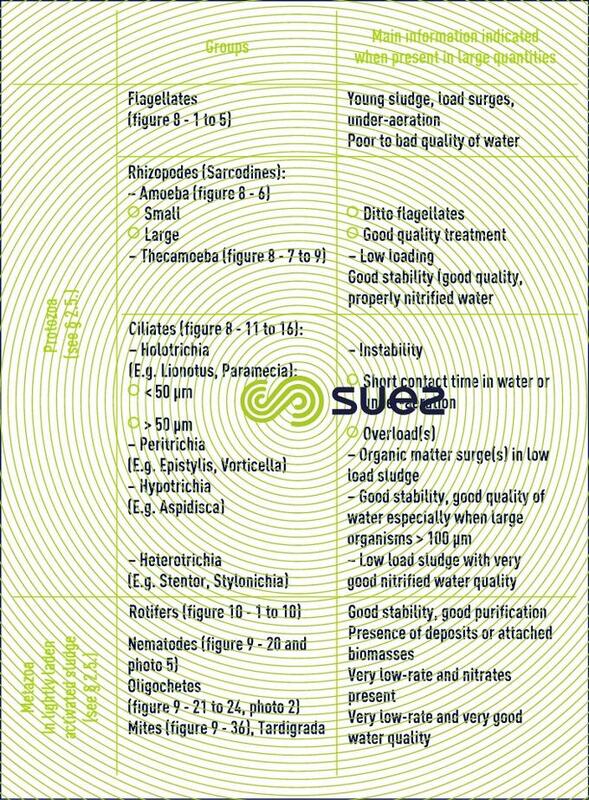 As an example, table 9 contains a list of the main "animals" found in activated sludge, together with the information that may be obtained by observing the proliferation of a given group or species. Demersal algae will develop on the periphery of plant and cells will be carried away in the sludge or from nitrifying filters due to biofilm abrasion. For instance, diatom frustules can be seen under the microscope. However, unlike the case of lagooning, these algae have no role to play in purification using activated sludge processes. We know that, in lagooning, ecosystem operation is based on, among other aspects, a symbiosis between aerobic bacteria and micro algae (see different types of lagooning; of the latter, the most common are planktonic species that are unicellular or, in any case, small in size, including green algae, blue-green algae, phytoflagellates and diatoms.